Warning: the photo at bottom of the post may be upsetting. As suspicious as I am of the boom and bust of individual ingredients (Goji berries… so hot right now… goji berries. 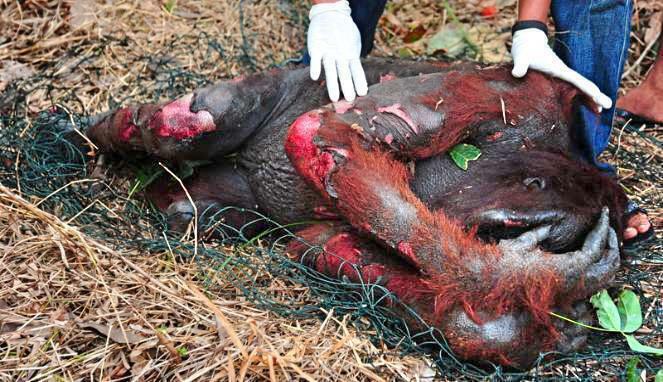 ), and the knee-jerk politics of the heart-rending image, I am ready to boycott palm oil because of a facebook picture. A friend of mine shared a very distressing picture of a deceased orangutan in a rainforest that was being clear-cut in order to produce palm oil somewhere in Borneo or Sumatra, and even though it was a random post that had come unmoored from its real-world coordinates like geography and photographer, I felt that commandment that Rilke described as emanating from the Archaic Torso of Apollo: for here there is no place that does not see you. You must change your life. Something about the poise and calm of those two captive forest dwellers, with the unrelenting shutter soundtrack of curious humans, boggled my mind. The name Orangutan comes from Malay/Indonesian words Orang (person) and Hutan (forest), and the phrase was apparently used to describe humans before it named this species of ape. Language diminishes when I try to describe the familiarity I felt: I want to say that I saw humanity in them, but it would be as fair to say I felt ape-ness in me, and what I really felt was shared consciousness, or simply love. When I was ten and became a vegetarian, it was for 100% sentimental reasons; I had seen a dead dog, and I felt very, very sorry about it, and a dead cow no longer seemed meaningfully different. In the following 20 years I’ve moved to more rational arguments about factory farming, clear-cutting and methane, and I don’t fear or avoid thinking about death nearly so much. But one of the costs of growing brusquer and more realpolitik is that I’m skeptical of my emotional response, when really my gut feeling is the word from my conscience. So taken as a list of grocery ingredients and a lone species in a world of embattled species, these actions have a kind of nitpicking focus. But when you consider that palm oil may be an ingredient of nearly 50% of consumer products, from girl scout cookies to biodiesel, this information actually points to the inseparable relation of all our progressive issues. Transnational processed foods and products that destroy local economies and ecosystems are moved by the same engine that willfully doesn’t recognize consciousness in anyone but humans. This misrecognition is amplified by how far we have wandered from our own forest-dwelling days, and manifests in our subjugation of even those humans who live more closely with the natural world. Rainforest destruction fuels the climate crisis in countless obvious and less obvious ways. Pick one thread to follow and you’ll find yourself in a dense weave no matter what. When I lurk on facebook, especially as my activist friends use the platform to spread their good words, I can get the feeling of thousands of intractable problems competing for limited bandwidth and human energy. My skin toughens to resist a larger and larger portion of petitions, ‘like if you agree’ posts, baleful stray pitbulls whose days are numbered. I rely on skepticism, the same defense I bring to bear on the onslaught of advertising we all wade through to get to the goods of content and meaning. But sometimes recognition breaks through the defense, and with recognition comes the certainty that I must change my life.